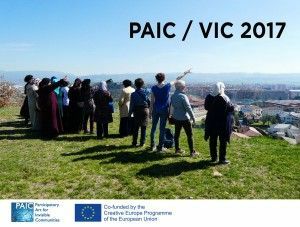 PAIC Participatory Art for Invisible Communities is a multidisciplinary project, based upon methodologies which combine artistic practices with collective community participation. Its mission is to strengthen cultural identity in isolated or invisible contexts. It combines research and the activation of processes with short- and medium-term actions, involving local agents (individuals and various organisations), artists (those who form part of the local context, and/or those invited to join), the organising partnership ( the four countries involved) and collaborating institutions (linked to their localities). PAIC objectives are to promote contemporary art within a social and territorial context; to enhance elements of identity and culture; to enhance teamwork and interpersonal relationships; to develop an artistic project among a variety of participants who form part of their local communities; and to generate interdisciplinary work between local and foreign artists. Between 2016 and 2018, the activities which will take place are artists' residencies, workshops, round-tables, and activities related to the research and analysis of the experiences and contexts involved. The cities in which the specific experiences are taking place, are: Søro (Denmark) Osek (Slovenia), Vis (Croatia) and Vic (Spain). The partners participating in the project are Omnimedia, Søro Kunstmuseum, University of Nova Gorica and ACVic Centre d’Arts Contemporànies. The project is funded by Creative Europe Programme of the European Union. With the participation of members of the Aurora Gestió de Projectes Socials, Casal Mossèn Josep Guiteras, Centre Obert de Vic and Creu Roja. The workshop will take place at the headquarters of the various organisations, and at ACVic Centre d’Arts Contemporànies. This workshop is a moment of convergence between two artists, one linked to Vic and a guest artist, who will work with four groups of people connected to local organisations of a social nature. Activities prior to the workshop began earlier this year, with the aim of exploring the possibility of generating artistic activities with their users, and of setting up an open space in order to dialogue with a citizenship which often ignores them. The use of contemporary art methods to impact upon social issues by means of participative actions is an asset which must be shared with other, very different disciplines, in order to teach how to approach, how to work with and how to bring to light, for example, issues related to people who form part of communities suffering from reduced social visibility. The prior work is fundamentally based on listening, a calm, progressive and respectful approach, in order to cultivate the trust of users, as well as the compliance of responsible agents already working in different organisations, sharing and respecting the activities carried out in order to create a new network of involved participants. The previous activities, led by local artist Jordi Lafon, were designed to build a space of trust, but also to set out the activities that each group may have interest in developing. Users responded to questions, such as, What are our skills? What would we like to do? What could we do together as a group? The workshop between 18th and 28th April will incorporate new methodologies, so that the four working groups, which until now were developing their own processes by themselves, may reach a common ground, in order to enhance their skills, their needs and desires, in a context of socially richer and more complex work. In this sense, the experience of the Croatian artist Sonja Vuk will help to facilitate this shared working environment. Sonja Vuk is an artist and assistant professor of interdisciplinary projects and video art at the Academy of Fine Arts in Zagreb. She is interested in interdisciplinary projects which make a connection between social issues and experts in networks from various areas, particularly education, psychology and sociology. She has participated in numerous solo and group exhibitions and video festivals worldwide (MCA, Croatia, White Columns, New York; Akureyri Art Museum, Iceland; Arnolfini, Bristol, United Kingdom, among others). She has extensive experience giving workshops and lectures internationally. Jordi Lafon is a visual artist, professor of Creació Artística i Participació at the University of Vic and the Mural Workshop at Escola d'Art i Superior de Disseny de Vic. His latest works revolve around participation, collaboration and shared learning experiences such as: walking as an aesthetic practice, drawing, photography and writing projects such as Marges i Fronteres, Deriva Mussol, Goula. Projecte d'art, joc i memòria, Encontre, Com una Cadira and Criss-Crossing. Is participation a good thing in every case? Realities and fictions. Fabiola Mora, technical of the Participació i Educació Ambiental of the Ajuntament de Vic. Judit Font, a specialist in issues of participation and coordinator of the Ateneu Popular Nou Barris de Barcelona. The institutionalisation of participation has made it possible for the exercise of direct democracy to reach closer to public policy. Its expansion and popularisation means that participatory dynamics are now an absolute prerequisite before deploying many actions regarding policies or planning, turning citizens' demands into a normalised practice. Also In the field of art, a series of artistic practices oriented in this direction has long been deployed, in which participation stands at the midpoint between, on the one hand, the activation and motivation of new audiences, and on the other, collaborative dynamics. As part of a project which embodies a willingness to experiment with these kinds of practices, we believe it is an opportune moment to ask ourselves whether participation is useful in every case, and to debate about its potential or its shortcomings. During the debate the results of the workshop led by Jordi Lafon and Sonja Vuk will be presented, with the participation of members of the Aurora Gestió de Projectes Socials, Casal de Mossèn Josep Guiteras, Centre Obert de Vic and Creu Roja .